Description: This class provides the student with an introduction to one of the popular and fastest growing areas of jewelry making. 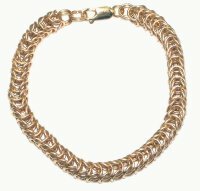 Chain-Maille’ Jewelry is based upon the protective armor worn by medieval knights. The old designs have been updated for use with precious metals to make beautiful chains, necklaces, bracelets, earrings, etc. These are easily made and do not require any soldering. Students will learn the proper way to open/close jump rings, basic patterns of linking the rings to form intricate chains, and finishing techniques to make the chains into wearable jewelry. The class will consist of a couple of pre-selected projects teaching the basic techniques followed by other projects which students can individually select. Students will learn to cut their own jump rings. Projects will be done in Sterling Silver; but other metals can be used. Students will complete 4 different projects..
Materials: Kits with pre-cut jump rings will be available from the instructor for the first project. Wire to cut the jump rings for the remaining projects will be available from the instructor or students can bring their own.